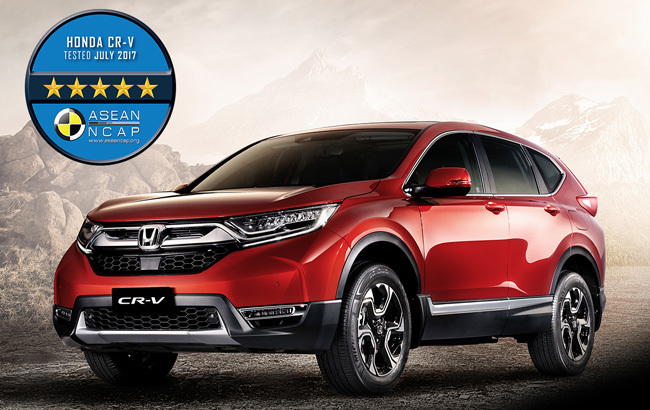 The All-New CR-V achieved 5-star safety rating from an outstanding overall score of 88.8 out of 100. The new ASEAN NCAP Assessment includes a frontal offset impact test, side impact test, and evaluation of safety features such as the Honda SENSING. The All-New CR-V also received impressive scores for Adult Occupant Protection (AOP), Child Occupant Protection (COP) and Safety Assist. The All-New CR-V SX Diesel 9AT AWD comes with Honda’s advanced driving assist system called Honda SENSING. The advanced technological feature consists of a millimeter-wave radar and monocular camera mounted on the upper, inside part of the windshield which provides greater awareness of driving conditions around the vehicle. It also provides warnings to the driver and supports the driver in avoiding or mitigating the severity of a collision. The SX Diesel 9AT AWD, S Diesel 9AT, and 2.0 S CVT variants are also equipped with Honda LaneWatch, a unique system that displays an additional 80 degree view of the right side of the vehicle from the side mirror view using a camera built into the passenger-side mirror. Both technologies received awards from the “Safety Technology” car maker category at the ASEAN NCAP Grand Prix Awards in 2016 and 2014 respectively. The All-New CR-V offers a full range of active and passive safety features, along with the standard body structure featuring Advanced Compatibility Engineering (ACE) and G-Force Control (G-CON) technology, Dual SRS Airbags, i-Side Airbags, Side Curtain Airbags, Vehicle Stability Assist (VSA), Hill Start Assist (HSA), Emergency Stop Signal (ESS), and a Multi-angle Rearview Camera. All of these features further ensure the safety of all passengers of the All-New CR-V.
With Honda’s global slogan “Safety for Everyone”, Honda will continue to provide reliable vehicles for a safer society.